The advent of the era of big data has opened up new opportunities for biomedical research and precision medicine, and also it has brought new challenges to the existing laws and regulations. The value and principles of autonomy, privacy, and personal data protection are revisited and reevaluated in view of the new trend of technology. 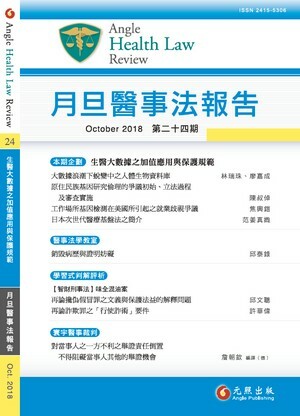 This article touches upon the following crucial issues for development of biobanks in Taiwan, and hopes to invite more discussions in this area: How to properly harmonize the difference between “Human Biobank Management Act” and “Human Subjects Research Act”? Whether to link health data to enhance the values of a human biobank? How to fine-tune the informed-consent model considering the technological advances? How to manage and develop the resource of current human biobanks?